Out With The Old--In With The New!! In an attempt to Usher in 2008 and say a Fond Farewell to 2007--its time for the Second Nats320 Ins & Outs for The New Year!! All in Fun--in no particular order. In--Section 218 (at least for The African Queen and I). Out--Section 320 (The Place where we enjoyed more fun than we could have EVER IMAGINED. Sohna and I are going to miss that Section 320--it was special--for SO MANY GOOD REASONS). In--Nats320 Blog keeps its name. Out--Despite Moving from Section 320 to Section 218. You Gotta Remember Your Roots. In--A Real Club Level with Amenities. Out--Zero Amenities at RFK--except for what you brought yourself to the park. In--Limited Sun Protection at New Nationals Park for those Sultry DC Summers. Out--Plenty of Shade or Cover from the Overhangs at RFK. Sun Protection may be one of the most important elements at New Nationals Park. 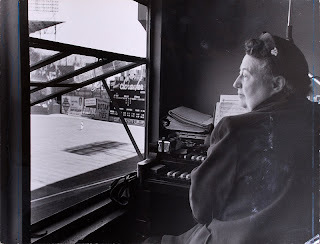 In--Virtually No Weekday Afternoon Getaway Games (Maybe Sun Protection will not be needed as much) Out--Plenty of "Businessmen Specials"--consistently our favorite ballgames. In--Wide concourses--sightlines throughout the new park. Out--The narrow dark and walled-in concourses of RFK. In--Real Grass that will last an entire 81 Game Schedule. Out--No longer sharing the field with DC United. Both of whom destroyed RFK's Turf over the summer months. By the end of each previous baseball season--The RFK Field looked AWFUL!! In--Another chance to prove that Washington, DC is a GREAT BASEBALL TOWN!! Out--Only Baltimore Oriole Fans up the Parkway, their Owner and Major League Baseball itself--may have yet to figure that fact out. Sadly. In--Limited Parking for New Nationals Park. Out--10,000 Parking Spaces at RFK. In--Metro. Out--Metro's Never Out--they just need to Step To The Plate and Deliver on New Nationals Park Transportation. They can offer NO EXCUSES. Everyone is depending on them. In--Centerplate (as new Concessionaire) Way Out--Aramark (Actually The African Queen is such a Fabulous Cook--I think if see applied for the concession contract against Armark straight up--she might even have won over their poor work.) Aramark will not be missed. In--Once Completed--Three Statues of Washington Baseball Greats (Walter Johnson, Josh Gibson and Frank Howard), as well as--a revolving mobile at New Nationals Park. Out--The Robert F. Kennedy Bust outside the Main Entrance to RFK Stadium and not much else. In--Home Team Batting Practice watched by Ticket Holders. Out--Only over a three day period last September, in three years, did Ticket Holders get to watch ANY Nats Batting Practice. In--First Base Dugout for Our Washington Nationals. Out--3rd Base Dugout for Our Washington Nationals. In--Reportedly Finest In The Game HDTV Scoreboard. Out: That Tiny Screen in Upper Right Field at RFK that, at times, was hard to read. In--Digital Stereo Sound. Now EVERYBODY CAN ACTUALLY HEAR CLINT!! Out--Muffled, virtually inaudible sound system at RFK--where you could NEVER UNDERSTAND WHAT CLINT SAID! !--Some might find the old sound--comforting though. In--Bullpens where fans can actually chat with the players. Out--Bullpens so far removed from Fan Contact--they might as well have been in the parking lots. In--Our Washington Nationals actually have some good young prospects in the lower minor leagues. Out--a virtually bereft of talent minor league system inherited by The Lerner Group, Stan Kasten and Jim Bowden. Really, in a short period of time--there is hope coming from below. In--Still no really solid Starting Pitching. Out--No Solid Starting Pitching. In--Hopes for The Return of Livan Hernandez to the fold. Out--Any chance for a Bookend Moment with Livo throwing the first pitch at New Nationals Park on March 30--should not be missed. Fan Favorite and GREAT ENTERTAINER. And, that's what the game is all about. In--Hopes that Starting Pitching can somehow make it out of the 6th inning more often. Out--Overused Bullpen which was burnt to a crisp by 2007 Starters flaming out early. In--Young Pitchers named Detwiler, Clippard, Lannan, Mock & Chico on the 40 Man Roster. Out--A list so long of mediocre talent, its too large for this posting. More than anything--young pitching talent shows the direction of Our Washington Nationals. In--A Championship Caliber Bench for Our Manager Manny Acta. Out--A Bench with Robert Fick and D'Angelo Jimenez first up (what a difference a few months make). In--A Healthy Nick Johnson. Out--A Slow Healing, Unable to Play in 2007--Nick Johnson. In--A Conscious Free Austin Kearns. Out--Although Kearns' incident with Nick Johnson was only just an accident--deep down inside--you just know Austin was hurting last year over Nick Johnson's slow recovery. Pride tells me that. Austin Kearns needs to be set free--mentally. In--A HUGE OVATION the VERY MOMENT Nick Johnson sets himself on the field at NEW NATIONALS PARK--A Feel Good Moment--like no other. Out--Sadness of not seeing Our Number 24 take the field in the final season of play at RFK Stadium. In--"The Most Thrilling Closer In The Game"--successfully so. Out--Hopefully, "The Chief Cardiologist" has studied up on his late inning Heart Wrenching Performances--where everyone needed an Automatic Defibrillator to survive. But, you could never say Chad Cordero is NOT INTERESTING--each and every time he trots to the mound to take the baseball. Yeah, Sohna and I LOVE "The Chief"!! In--The Return Of Ray King. Out--So Jimbo can trade him again for a prospect come July or August. In--A Hopefully Decent and Respectable Elijah Dukes. Out--The Troubled Person that he has been throughout his young life (Lets Only Hope). In--A Starting Catcher in Paul LoDuca, who just two days after signing with Our Washington Nationals saw his career turned upside down by The Mitchell Report. Out--A Quality Human Being in Brian Schneider. In--Lastings Milledge. Out--My Main Man!!! Ryan Church. "Church on Sunday", or any other day for that matter--will never be the same. And the fact that Church will MISS THE POPE in April--really will be a missed opportunity for some fun with his name. In--FLop is back. Out--But according to Barry Svrluga at The Washington Post--Felipe Lopez is NOT CONSIDERED the starter at second base in 2008. In--Ronnie Belliard is back. Out--he personally put Lopez out of the lineup and on the bench by consistently fielding and turning The Double Play, as well as, ANYONE IN THE GAME last season. Our Number 10 was fun to watch--always gave his best on the field. You could never doubt his efforts in 2007. Impressive at times. In--Just 5 Former Montreal Expos Players still on Our Washington Nationals Roster (Cordero, Rauch, Hill, Patterson and Johnson). Out--Three Dozen Others--most all for the better. In--More Home Runs, More Extra Base Hits--More BIG RALLIES. Out--Baseball after Baseball hammered--then landing in an opposing fielder's glove on the Warning Track at RFK. Very Frustrating At Times. In--Virtually NO FOUL Territory outside the baselines at New Nationals Park (Batters are Going to Love it.) Out--Spaciously wide foul territory at RFK (Pitchers are going to Miss RFK). In--Hopefully a .500 Record for 2008. Out--Anytime winning Just 73 Games is considered a Successful Season. In--Our Let Teddy Win!! Chant. Out--A Regular Staple before each and every single 7th Inning Stretch late in 2007 at RFK Stadium. Teddy's Coming Out Party occurred in late July when Teddy--reacting to the Enormous Crowd Response to his presence in the tunnel to the left of Section 320--stood on the Railing to take in The Love. A moment that found most everyone along the third base side of the old ballyard--turning to look. The Commotion so loud--Saul Rivera actually stepped off the mound, Ryan Zimmerman stood with his hands on his hips--glancing into the crowd. The Entire Nationals Bench was peering over top their 3rd Base Dugout. That Instant still stands as one of My Favorites of 2007. Teddy had ARRIVED!! At that Moment In Time--it DID NOT MATTER--what the score was on the field. Very, Very Special. In--The Rumored 5th President? On The Outs--Someone Teddy Can Beat? In--The Sight of My Best Friend Screech!!! Flying UP to visit Sohna and I at First Pitch of every game in Section 218. Out--In Section 320, he just had to walk up an aisle to greet every one of us. Now--he's going to have to scurry to Club Level. Can Screech MAKE IT? In--The Curly "W" Logo is HERE TO STAY. Out--The "DC" Logo continues to be phased out. As I have stated before--I LOVE The Curly "W", but I also enjoy The "DC" Logo. There is room for both. And Finally--The Nats320 Blog continues to be on your "IN" reading list concerning Our Washington Nationals. Out--Hopefully, not for a Long, Long, Time. 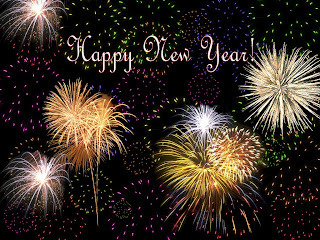 Sohna and I wish each and every one of you--A Safe And Happy New Year for 2008!! Let The Fun Begin at New Nationals Park!! Go Nats!! & Let Teddy Win!! Let Teddy Win!! Let Teddy Win!! With Calendar Year 2008 just around the corner--the beginning of Spring Training in just 7 Weeks--some questions and thoughts are on my mind as 2007 comes to a close. Like--What EXACTLY is the status of Charlie Slowes? Neither Our Washington Nationals or Charlie have said ONE WORD--which I take as a professional approach to negotiating. But, I am still worried. Any further delay in getting Charlie resigned and in the broadcast booth with Dave Jageler--better be a routine matter of just getting the contract signed. After three years of hearing that man GIVE HIS ALL on Nats Broadcasts--its only right that Charlie return for New Nationals Park--calling Washington Baseball Games--no one elses. Although some within Our Washington Nationals mentioned to me that FanFest or The Winter Caravan--whatever is the final wording--will be scaled back for 2008 due to the push to get New Nationals Park ready for Opening Night--can we please get some details on what will occur? If there is ONE EVENT any baseball fan wishes to attend during the off season--THIS IS IT!! What Baseball Fan doesn't want to meet and greet, Players, Coaches & Managers? Please, just make it so--give up some dates--so plans can be made. Opening Night March 30th--Sohna and I vividly recall the VERY FIRST GAME Our Washington Nationals EVER PLAYED at RFK STADIUM. The March 30th, 2005 Exhibition Game against The New York Mets. The TEMPERATURE WAS FRIGID!! Maybe that Holiday Card Washington sent to all Season Ticket Holders showing a Snowball transforming into a Baseball--was a Harbinger of things to come? Remember last April, 2007? Below 40 Degrees most every night game. One evening--it actually snowed against The Braves. We understand the importance of The March 30th Date to Showcase New Nationals Park and The African Queen and I support the effort. But, the weather that evening may be more akin to A Redskins Football Game. The Weekday Afternoon Getaway Baseball Games will be at the minimum for 2008. Personally, I am sorry to see them curtailed. There is just something special about watching a Major League Baseball Game when you KNOW--everybody else is working at their day jobs. Others may not feel that way--but Sohna and I really LOVED THOSE WEEKDAY DAY GAMES--consistently the most entertaining games. Besides, NO ONE wants to lose the last game of any series. They were FUN!! Hopefully, Weekday Getaway Games return more in 2009--once the Parking and Traffic Situation pans out at New Nationals Park. Speaking of start times--not all weekday games will begin at 7:35PM--as was mentioned a few months back--just the Friday Night Games. Monday through Thursday ball games will begin on South Capitol Street at 7:10PM--just five minutes later than the previous three seasons at RFK Stadium. Those times all work for me. Monday through Thursday--I am usually working the following day--the earlier start helps on those dates. Friday Nights--most always not working on Saturday. The 7:35PM start will allow The African Queen and I to enjoy New Nationals Park more thoroughly at least once--each home stand--without rushing to our seats. As he did in 2006--Our General Manager is building a Bench for Manny Acta you would expect to see more on a Contender. Jim Bowden has assembled some good talent that Our Manager can maneuver with--late in games. Depending on who starts--Aaron Boone, Dmitri Young (or Nick Johnson), one of Flop, The Guz and Ronnie Belliard. Rob Mackowiak, Ryan Langerhans, Jesus Flores and one of either Elijah Dukes, Wily Mo Pena or Lastings Milledge--all might be available off the bench. That sure beats Robert Fick and D'angelo Jimenez as Manny's first choices. More importantly--these parts are all interchangeable. Flexibility is important off the bench. Our Washington Nationals should be pretty respectable in close games--now that The Bullpen may not have to carry THE ENTIRE LOAD--and worry that giving up EVEN JUST ONE RUN--means the ball game is lost. And no--I am still not sold over Dukes. But, as mentioned before--Sohna and I won't just turn our backs on someone. Yet, Elijah has to prove himself--both on and off the field--for an extended period of time--to be accepted. We still think that's fair. Having been so busy leading up to The Holidays--I don't recall Paul LoDuca having spoken publicly about his implication in The Mitchell Report. I am curious to see how he handles everything now. Really, Paul LoDuca can ONLY WIN if he shows up in DC and has a solid season in 2008. Anything less and the public will only see, in him, another Major League Player that fooled every fan in previous seasons. At the same time--I remember reading Tommy Glavine raving about working with LoDuca behind the plate in a recent article. Yet, not one other of his former teammates for The Mets--made similar gestures. In fact--many New York players were quoted in various New York Newspapers last week--how they were looking forward to the quality and stability Brian Schneider will bring to their catching situation and pitching staff in Queens. Interesting. On a young staff--I would still take Schneider--even before Steroid Issue arose with LoDuca. But, there is nothing more that can be done about that fact now. Even I realize--time to move on. And speaking of The Pitching Staff--I like that Tyler Clippard trade for Jonathan Abeladejo. Never heard of Clippard before the trade--but whenever ANY TEAM can pick up a potential young starter for a reliever---a replaceable bullpen man that Washington picked up for free from The Pittsburgh Pirates--you gotta appreciate the ability of Jimbo to broker such a deal. As Our General Manager--Jim Bowden has been consistently good at picking up lesser known talent from other organizations, for little--and succeeding with them. His Owners--The Lerners--must love the fact that he picks up talent while reducing payroll. Eventually though--that Payroll will have to rise--when Our Washington Nationals become an ESTABLISHED TEAM--hopefully sooner than everyone thinks. Happy to see John Patterson offered a contract. Washington has NOTHING TO LOSE by resigning him. JP is needed in The Starting Rotation. And after meeting him last spring in Viera, Florida--Garrett Mock intrigues me as MY DARK HORSE FAVORITE for the 2008 Rotation. Injuries have hampered his development over the past two seasons--but remember--Mock was THE TOP PLAYER traded for Livan Hernandez in August, 2006. Matt Chico may well be more polished now--but Garrett may well be the more explosively talented. "The Most Thrilling Closer In The Game" seems to be back for 2008. All the rumors surrounding The Winter Meetings--named that Chad Cordero was sure to exit Washington, DC before Christmas Day. But, why should Jim Bowden trade him--just to trade him? Our Number 32 has value--on the field--at the conclusion of every tight ballgame. Despite his many "Cardiac" Efforts--113 Saves as a member of Our Washington Nationals--is not chump change--in anybody's league. Finally--a more solid overall team appears on the horizon for Our Washington Nationals in 2008. Maybe not as fan friendly and warm, but certainly more offensively minded--especially in the outfield. If Nick Johnson REALLY is finally turning the corner in rehab--what a nice bonus to see Our Ultimate Team Player return healthy and ready to play ball for 2008. Milledge, Zimmerman, Johnson, Young, Kearns, Pena (Maybe Dukes), there's some pop in those bats. And, I can live with Cristian Guzman at short and Belliard at second for one more season. Felipe Lopez still needs to get his act together though. Overall--No--that's not a bad team--on the baseball diamond. Those are just a few Odds & Ends on my mind about Our Washington Nationals--this Holiday Season. PS--Now To The Important Stuff--Sometimes the simplest things are THE BEST! The African Queen came up with "Curly W" Bedroom Slippers for Christmas--as a Stocking Stuffer. Now--That's COOL!! Unexpected and Very Sweet!! Sohna gets some HUGE POINTS for this one!! And I thought I HAD EVERYTHING--A NATS FAN COULD POSSIBLY WEAR! Calendar Year 2007 has been wonderful for Sohna and I. Through Our Love of Our Washington Nationals, we have formed many new friendships. Fellowships we hope to cherish for years to come. And thorough The Nats320 Blog, The African Queen and I have found many like minded baseball fans. Devoted admirers of The Great Game--that love to exchange ideas and thoughts with us. Unexpectedly so, and out of nowhere--The Nats320 Blog has become a MAJOR PART OF OUR LIVES. Never did we EVER expect those many thoughts laid out here--to reach, and touch, so many fans of Our Washington Nationals. Never did we EVER expect so many to care. Yet somehow--many of you found us and responded. For that continuing support--we are so very grateful. Because, if not for Our Many Readers--The Nats320 blog would be nothing special. Since December 2006, it became apparent and important for me to make an attempt to provide something different--posts that just didn't rehash what was written in the daily newspapers, reported on TV or talked about elsewhere. The Nats320 Blog needed to be original. The Nats320 Blog needed to be fresh--if it was ever going to be fun--and last. Through resourcefulness and a little bit of luck--networks were forged, relationships made--all in the attempt to be a little different--while providing information, and showing, the fun Sohna and I have enjoying Our Washington Nationals each and every day. Material not necessarily available elsewhere. Through alot of hard work, sleepless nights--and the continued support of The African Queen--we believe The Nats320 Blog has succeeded. We are PROUD of that fact this holiday season. Pleased, that The Nats320 Blog is read by you. Appreciative, that so many have stated their enjoyment for Our Efforts. Those simple facts alone--make The Nats320 Blog REWARDING for us. So, with that in mind--Sohna and I wish EACH AND EVERYONE OF YOU--A MERRY CHRISTMAS, HAPPY HANUKKAH, A BLESSED EID or JOYOUS KWANZAA--whichever is your Celebration of Choice this time of the year. And we hope that in 2008--The Nats320 Blog will continue to be--ONCE AGAIN--Worthy Of Your Support!! Thank You So Very Much--And Happy Holidays!! Since this past Sunday--I have been away on Special Assignment for my television network--limited email and cell phone capability also--which is strange and odd in this day and age. Hope to be back by Friday. At that time--I will be able to catch up on the past week of Our Washington Nationals. At that point in his life, This Newly Commissioned Artist at New Nationals Park was looking for a change in his career path. Eventually, Walter Kravitz ended up at George Mason University in Fairfax, Virginia. “I heard about George Mason, why back when," said Kravitz. "As you know, George Mason was created as an alternative education to UVA (University of Virginia). It’s the only reason Mason got its original plot (in Falls Church). The school was all technology. And when they came to Fairfax, they were all about technology and new materials. My teaching is always about new invention and new materials. Public Art came with that. Part of my teaching is to invent new ways to solve old problems. So, that’s the reason I came to George Mason to start teaching here." 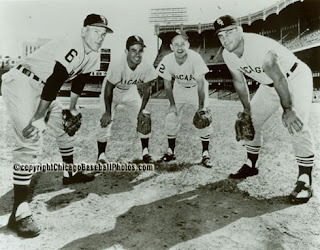 Today, as we continue with Part Two of My Conversation with Walter Kravitz--Walter talks about his brother's passion for The Brooklyn Dodgers and his frustration with The New York Yankees, growing up in Chicago. Having grown up with The Expansion Senators--I always felt the same way about The New York Yankees as a child. Walter's childhood recollections brought back all those memories of The Yankees of my youth. From there--it was time to move on with our discussion about his artwork. 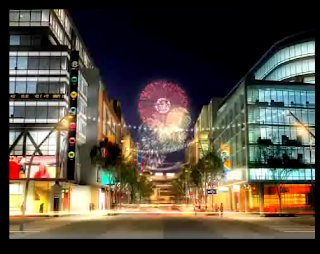 “If the installation runs any later, I would rather hold off and put it up for Opening Day of the following year. No one would be seeing it over the winter after just a few short weeks of the artwork being on display. But, I think I can do it by July—no problem. I have other work to do—but July is reasonable." Hopefully, Walter, along with many fans of Our Washington Nationals will not only view some Good Baseball in The Nation's Capital in 2008 and beyond, but also a very fine piece of artwork representing The Game--on display--at New Nationals Park in the very near future. Walter Kravitz is an avid baseball fan. He is also a well known artist of large-scale drawings and paintings. Those two passions in his life have now merged together. Because Walter Kravitz was recently announced as The Artist for a special piece of art at New Nationals Park. The DC Commission on The Arts & The Humanities last summer put out calls for a large suspended work which will hang between home plate and first base on the Main Concourse. As fans enter New Nationals Park from Potomac Avenue, SE--the hope is that everyone will have the opportunity to reminisce about their love of the game. As, while viewing the expected work above their heads--all any fan has to do is nod his or her head down--where right in front of them--will be the actual field of play. Walter Kravitz is a Full Time Faculty Member at George Mason University in Fairfax, Virginia. A Professor of Painting and Drawing who has completed over 25 Public Commissions--including "U STREET SOUND"--the five story tall centerpiece of the Grand Entrance to The Reeves Center at 14th & U Street, NW. Ironically--Mr. Kravitz has also completed artwork for The Lerner Family. 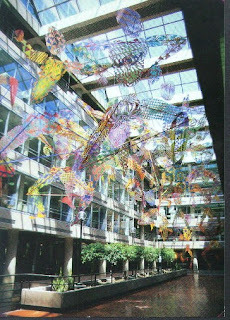 A work that sits in one of The Lerner's Office Buildings in Rockville, Maryland. So, it just seems fitting that Walter was chosen as the artist for this new piece to be suspended at New Nationals Park. When Tony Gittens, The Executive Director for The DC Arts & Humanities told me that Mr. Kravitz had won the award to produce this piece--I contacted Walter to gauge his interest in speaking to me. He was willing and ready--as soon as he received his model back from The Commission. Recently, we got together and this interview is the result of that meeting. Being baseball fans--and knowing some of the same friends from George Mason University (SBF worked in The Sports Information Office at GMU many years ago)--we hit it off great. My original thoughts of chatting with Walter for thirty minutes--lasted 90 minutes. Honestly, he's just fun to talk to, as we have alot in common. So--this will be a two part interview. Not only will Walter Kravitz discuss his upcoming Suspended Artwork at New Nationals Park, but he will touch on his love of baseball--growing up in Chicago--AS A WHITE SOX FAN!!! Walter and I chatted in his Art Studio on Capitol Hill--standing beside the model of his intended work for the new ballpark. Walter and I were having a nice time talking baseball. Really, its always fun chatting about the sport. But, we both had to get back to the topic at hand. Oh well. But later, we would digress a few more times. “That’s another variable. Originally, I had planned to use Komacel—which is a PVC. It has a corrugation in here (showing me) that is imperious to the weather. Thus, it can be used outside. And, this (picking up another piece of material) is a more permanent material that the company would be willing to warrant for a longer period of time, called Komatex. Its just more impervious. However, even with this (Komatex) which is PVC based—they would only warrant it for five years. That’s the best I could do, which wasn’t enough. So, I decided to use the material that I usually work with—which is a polycarbonate material. This material can bend with heat. And, the color I am going to be using is a pigment called acrylic urethane—which is permanent. “I have to make the figures so the bottom of anyone of them must be 10 feet from ground level. Then, a person would have a hard time reaching them. 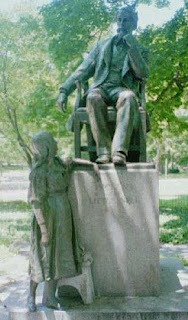 If the figures are vertical—they are six to seven feet in height.’ (Mostly life size—SBF) “Yes, they are life size. That was the idea. Now, I feel baseball fans want, myself included, a close reading. Most public art is to be seen in its entirety. My feeling is that if someone comes into [the ballpark from Potomac Avenue] and comes up the stairs and sees these figures rotating—they will get a good idea of the overall concept—but mostly they would want to also see the individual figures and their actions. So, making the figures close to life size was important to the experience—that makes those figures come to life for the viewer. Since the field is on the opposite side of the Potomac Avenue Entrance—viewers can walk right up, check out all the figures, and then go directly out to the field. Perfect." “Well, my daughter played for a softball team actually called--The Washington Senators--right here on Capitol Hill. They went down to Florida to play in a Championship Tournament, and they wore regular length pants and socks—very much like Major Leaguers. But, here (playing locally) they wore shorts—not sure why. But, it simply is not going to be a big difference (no matter who is represented in the figures). That concludes Part One of my conversation with Walter Kravitz--Artist for The Commission Suspended Artwork at New Nationals Park. Tomorrow, in Part Two--Walter will share a few more baseball stories. His brother was an AVID Brooklyn Dodgers Fan and Mr. Kravitz remembers how "The Yankees always killed us (White Sox)." Of course--we will continue our discussion of his upcoming artwork on South Capitol Street--including the expected date of delivery and installation. Thanks to a poster over at The Ballpark Guys Forum where I first saw this video--but its worth a good look. 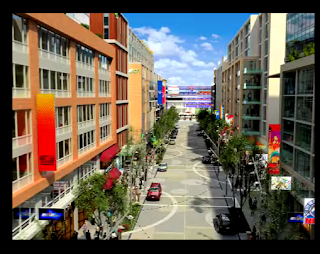 Monument Realty has produced a Computerized Rendition of their hopes for Half Street, SE--the walkway which leads directly from The Navy Yard Metro to the Main Left Field Plaza Entrance to New Nationals Park. Sorry for the delay in posting about The Mitchell Report. For the past 36 Hours, I have worked exclusively on this topic for my television network. In fact, at the time not many Baseball Folks are speaking directly on the subject--we lined up an interview with The Toronto Blue Jays President & CEO--Paul Godfrey for television this afternoon. With that out of the way now--here's my take on The Mitchell Report. Baseball Will Survive. The National Pastime has always persevered its many problems. Even those where everyone involved has shot themselves right in the foot. The just released Mitchell Report involving Steroids And Human Growth Hormones is no exception. But, it doesn't take away the sadness of knowing that cheating was rampant over the past decade in Major League Baseball. Not only were star players involved in enhancing themselves physically---but some of the very last players on any team--The 25th Man--were juicing just to draw a Major League Paycheck. Why do you think the names of Tim Laker, Mike Lansing and Nook Logan are in Senator Mitchell's Report? Being called A Major League Player for your career, is far better than being called a Career Minor Leaguer. The salary doesn't hurt either. But, the hurt does not stop there. The Commissioner Of Baseball and Most EVERY SINGLE OWNER, and most every single Major League Team are equally culpable over the same period of time. For Greed, Money and A Revitalization of THE GREAT GAME after a terrible lockout in 1994--Most All of Baseball turned their backs on an ever escalating problem. That is not only sad--but reckless. Baseball was not only, out of control, but on the verge of destroying its own integrity. All for what has become all too common in The Great Country we all are so fortunate to live--American Greed. Being of Strong Character is important to me. Integrity Counts too. So, it continues to bother me that The Major League Baseball Players Assocation Executive Director--Donald Fehr--persists in stonewalling every investigation into this important issue. Sure, it may be his job--but it doesn't make it right. Whether Mr. Fehr believes it or not--Baseball has lost this extra inning affair. The Game is Now Over. A New Season is about to begin. Hopefully, Hope Still Springs Eternal. Whether you are a Major League Baseball Player, The Commissioner, Owner of a Team, or run The Players Association--many of you are unfortunately guilty by association--in the public eye--whether you were directly involved or not. That hurts me too. Honestly, it does. So, for once and for all--could you please get yourselves all together--on one page--AND SOLVE THIS CRISIS ONCE AND FOR ALL? Because--when Sohna and I step foot into New Nationals Park for that very first history making game to enjoy Our Washington Nationals on March 30, 2008--we don't wish to have ANY DOUBT that the game playing out in front us--is legitimate--in every way. Remember, we are talking about The MOST FABLED OF AMERICAN SPORT. The NFL or WWE--Baseball is not. If you are unable to work these issues out--that saddness, my hurt--for the game I love--will not go away for some time. Baseball, undoubtedly, will survive--but you have to clean up your act--now. The Damage has been done and the time has come to end any more denials--from EVERYONE. No, its not easy, when so many are caught cheating. But, your resolve must follow through. Your instinct must tell you to do the right thing. This Steroid/Human Growth Hormone Issue has to be resolved. Baseball needs--to not only find its lost character again--but its integrity--as well. I Love The Game--Always Will--but I find myself saddened over how Baseball has hurt every single fan--for over 10 years--with lies and half-truths. That's more than a decades worth--my friends. Clean yourself up Baseball--For the Good Of The Game! Baseball owes every one of its fans, who have supported Baseball through thick and thin, THAT EARNED RESPECT--AGAIN. As I continue with My Conversation With Brian Schneider, we pick up the chat talking about Washington, DC--as a Baseball Town. Yesterday, Brian mentioned how he and his wife, Jordan--would miss their many friends made over the past three seasons, as well as, all Our Fans. Here we go--with the conclusion. With that, My Conversation With Brian Schneider comes to an end. We had talked for so long--Brian realized he was running late--for a Tee Time--to play golf with former teammate and Original Member of Our Washington Nationals--Brad Wilkerson. "Yeah, I am suppose to be there in 15 minutes, gotta go. But, thank you, I enjoyed talking with you." Brian said. It was very kind of Brian Schneider to allow me some personal time to chat. When we first spoke on Tuesday, I didn't know whether he wanted to talk about his time in Our Nation's Capital. As it turns out, clearly--Brian and his family enjoyed living in Washington, DC, and will miss not being in the area. But, at the same time, I was glad to hear Our Former Number 23 see a new challenge ahead. An opportunity to Win The World Series. A Goal any Major League Player would relish. Good for him, and good for his family. Sohna and I only wish Brian Schneider, his wife--Jordan--and baby Tatum--The Very Best. On the very day, Our Washington Nationals introduced their New Starting Catcher--Our Former Starting Catcher returned my call. On Tuesday afternoon December 11th, Brian Schneider agreed to an interview for The Nats320 Blog. Since the very first moments, I heard about his trade to The New York Mets, thoughts began about getting together with him for a chat. Once contact was made--Brian happily agreed. Thanks to Sohna for some ingenuity. She got the ball rolling. As, Our Washington Nationals were not involved in setting this up--at all. Brian Schneider no longer plays for Our Franchise. Working around both our schedules--we were able to talk on the telephone today--Wednesday, December 12 at 1PM. We chatted for a good half hour. Everything was on the table for discussion. The Impact of the trade, his feelings, and his time spent living in Washington, DC. We also talked about his career. Where it's going, and where it just came from? How he feels about his just completed 2007 season? What role Brian played with the 2007 Pitching Staff of Our Washington Nationals? And, honestly--all due to luck and timing--Brian wanted to talk about Bill Ladson's comments written about him the other day. Commentary, that anyone who reads this blog knows--I made my feelings known. And, this was not a set up. I need to make that perfectly clear. I wrote what I felt that day--having no idea--at the time--Brian Schneider would be kind enough to speak with me--just two days later. But, I made the effort to reach out--as I always do--to get some answers. So, this will be a two parter. And, we are going to start by getting the commentary over with first. Then, we shall move on to discuss what this interview is really all about--Brian Schneider--Major League Ballplayer. Tomorrow--in Part Two--Brian will talk about his reaction to first moving here with The Montreal Expos and seeing a vibrant young fan base in Washington, DC. How Special Our Nation's Capital has become to Major League Baseball. Then, we will dive into baseball, just baseball. How he feels about his career--at this point. Where it's heading. And, his personal critique of his work over the past few seasons. Paul LoDuca's Fine. Nothing Special--a veteran on the downside of his career. For one year--he fills a void with the departure of Brian Schneider. No--he's not going to throw out many runners. And, by mid-season--for the short term at least--Our Washington Nationals will be lesser behind the plate. No doubt about it. But, what LoDuca does provide is the opportunity to bring along Jesus Flores at a more controlled rate. Our Number 3 doesn't need to be rushed now. And, in fact--would you really be surprised to see Our General Manager pick up Johnny Estrada also? That is, if The New York Mets release him? Pitching was the All-Comers Meet during Spring Training, 2007 For DC's Team. Who shall start at Catcher is the new "En Vogue" Position for Washington in 2008. Hopefully one year really soon--Our Washington Nationals will head to Viera, Florida--with a set lineup. At that time--We Better Be Contenders. Besides--Paul LoDuca's past personal issues fit the billing on the character traits added to Our Washington Nationals over the past few weeks. Something, The African Queen is not too excited about. Nor, I. We find it interesting that Good Character Now, for Our Team--means a character past, when it comes to new additions to Our Lineup. Oh well. In the meantime, what really intrigued me this afternoon was Bill Ladson's trashing of Schneider during his weekly Monday mailbag. "His temper tantrum is one of the reasons I've called the 2006 Nationals the worst team I've covered. When things were going wrong on any given day in '06 and '07, there was a good chance Schneider would be in the computer room or went home instead of facing the media. This team did not have a leader until Young came along." "When he faces the New York media, it would be nice to finally hear Schneider say that he hasn't performed up to his capabilities the last two years." Bill, maybe you can FESS UP--Too. Wow--thanks for letting the corpse dry before you slam him in the dirt--Bill!! Where does all that venom come from? You have covered Our Washington Nationals from the very first days of The Franchise move from Montreal. In fact, you worked for MLB in Montreal. So, you had to get to know Brian Schneider fairly well. So, why after so long being by his side--day in, and day out--do you now take the opportunity to rip him? Is this something personal? Because quite frankly--if you NEVER reported any of these so called issues with Brian Schneider during THE ENTIRE TIME you have covered Our Washington Nationals. Then, you have NO RIGHT to bring these issues up now. Especially, after he has been traded to The New York Mets. What's the real problem here, Bill? Really? Inquiring minds want to know. You know Brian Schneider was well liked, and well respected by Our Fan Base. Sure, I am sorry to see him go. Others not. But, I am positive none of us were ever upset to see how Brian treated EACH AND EVERY FAN HE EVER CAME ACROSS at Team Events. More times than not--Brian Schneider showed up to meet and greet EVERYBODY. Always had something nice to say to Fans of Our Washington Nationals. No other Media Outlet has ever questioned his regard and respect of his teammates in such a negative fashion. Only the Esteban Loiaza--Jose Guillen retaliatory pitch argument against The New York Mets in 2005--is the only big ruckus I ever recall Brian Schneider having with teammates. EVER. I am sorry--If Brian Schneider got sick and tired of you. But please, don't try to hang your dirty laundry out on us, the fans--publicly. Take that type of stuff elsewhere--or become an "Independent" Blogger. Until his right elbow started having problems from overuse in 2005--Luis Ayala was quickly becoming one of the finest SETUP Men in the game. The Man With The RUBBER ARM. Almost daily, it seemed--during that Inaugural Season of Our Washington Nationals, then Manager Frank Robinson slowly walked out of the dugout in the 8th inning and signaled for Our Number 56 to bring in his glove, take the baseball, and get Our Washington Nationals out of a jam. Did Luis ever respond--22 holds in a fine season in which Chad Cordero set The Franchise Record for saves with 47. 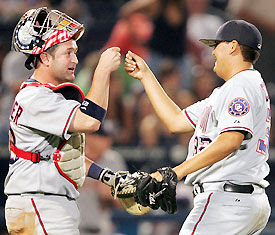 Only a few other bullpen mates combined to perform so well together during that 2005 campaign. Ayala and Cordero were quite the tandem. And, The ANCHOR STRENGTH behind one of the best Bullpens in the game that year. A Force that was cut short when Luis felt a twinge in his right throwing elbow, late during that summer. His constant appearances had finally taken its toll. Shutdown for precautionary measures in September of that year--Our Number 56 went through minor surgery to repair a bone spur. There were no complications. Luis Ayala would be ready for Spring Training, 2006. Or, so everybody thought. Then, The First World Baseball Classic was held during the 2006 February/March Time Frame. And, Ayala--against the wishes of Our Washington Nationals--decided to compete. Although--he had just began to throw fully--once again--pressure from former teammates--Esteban Loiaza and Vinny Castilla--was too great to allow Luis to see The Big Picture. And, as most every one knows now--he was wasn't even close to being 100% ready to pitch at the WBC. The awful sight that spring evening, seeing Luis Ayala holding his right elbow while walking, dejectedly, off the pitchers mound during a World Baseball Classic Game--gave the appearance of a funeral taking place. As a fan of Our Washington Nationals--it was a sad, gut wrenching moment. For love of his Native Mexico, Su Pais--Our Number 56's Major League Career might well be dead. Over with, done for--forever. Reconstructive Elbow Surgery was performed. Never did Ayala pitch in another Major League Baseball Game until this past June 22nd, 2007--against The Cleveland Indians--over 20 months between MLB appearances. Knowing he had let down his Major League Teammates--Luis Ayala worked hard to get back into playing shape. "I worked harder than I ever had in my life, " he told me. "I didn't want to disappoint again. I didn't want to go through that feeling." During that very first game back--Our Manager Manny Acta put Luis Ayala right into The Fire, that is Major League Baseball. And, he responded--holding a 1-1 tie in check by retiring Travis Hafner--Cleveland's Big Slugger on a bases loaded double play grounder in the 5th inning. A TRIUMPHANT RETURN you usually only dream about. Nervous at first--Luis Ayala settled down and his 2007 comeback campaign was decent--though not spectacular. But, by the end of this past season--he was becoming--once again, a respected, trusted player, out of Manny Acta's Bullpen--late. And, even recorded his only save of the year during his penultimate appearance at Shea Stadium in New York on September 26th. Now--with the start of the 2008 Championship Season--just a few short months away--Luis Ayala was kind enough to give me some of his time this past Thursday afternoon at The ESPN Zone in Washington, DC during his Guest Appearance there for Our Washington Nationals Boys & Girls Clubs of Washington Holiday Party. With a half season of Major League Baseball now, once again behind him--Luis says he is looking forward to what his future has in store for him. “I was very excited about how the season (2007) went for me. I know my arm is healthy now. My body is healthy too. So, I was happy to go home, relax and take some time off—especially after all the time off after the injury to my elbow. But, I realized, I now wanted to work out even harder (than I did) from the past. About two weeks ago, I began to work out again really hard. Really, I can’t tell you how excited I am to have the opportunity to come back and play here in the new stadium. Now, I am excited just to be back here in Washington." "I went to the dugout and said to Manny: 'OK—I am ready!!' (Luis and I bust out laughing—he’s now smiling greatly)." "But, seriously, I needed to be careful. And, the team (medical staff) worked well with me." And, Luis Ayala LOVED THIS LAST QUESTION. He didn’t stop laughing for about 15 seconds. With that, a hearty handshake and embrace concluded my chat with Luis Ayala. He's straight forward, honest with his thoughts. And, most pleasing for me, Our Number 56 is quite the character. Seemingly, always has time for others. And, enjoys the interaction of meeting different folks. When he mentioned to Principal Owner Mark Lerner later that afternoon at The ESPN Zone that he wished to remain a member of Our Washington Nationals for the remainder of his professional playing career—he meant every single word of it. “This is a great place to play. Good Atmosphere, Great Fans—Fun is the only to describe it. I really love it here in Washington, DC.” Luis Ayala concluded.